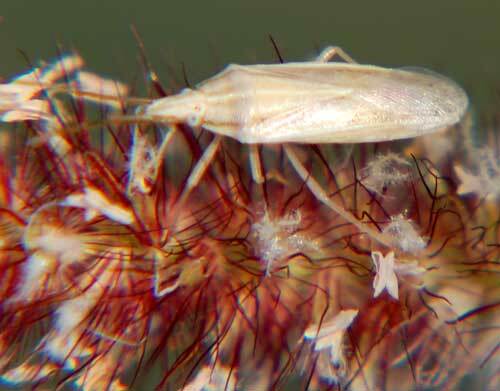 This stink bug was found feeding in a seed head of Buffel Grass (Pennisetum ciliare) in Phoenix, Arizona, Oct. 2009. It's feeding could help limit the invasiveness of this weedy grass by reducing seed viability. Most stink bug species have a clearly pentagonal shape. The narrow stink bug, Mecidea, still has the five-sided outline, but is so narrow as to obscure the pentagon. Like all stink bugs they feed with piercing sucking mouthparts, inserting them into developing seeds and withdrawing liquid contents. The adult at left can fly; when at rest the wings are folded neatly behind. Apparently these bugs favor feeding on grass seeds suggesting color and shape adaptations related to crypsis.